Taylor Marsh has repeatedly been posting Clinton talking points against Obama for months, and does it yet again today. The Clinton campaign held a conference call with bloggers earlier in the week to push their latest line of attack against Obama based upon his “present” votes in the Illinois legislature. Today Marsh brings up a case where Obama voted present on a measure allowing victims of sexual abuse to have court records sealed to protect their privacy. She ignores the fact that Obama has explained that he voted present because there were questions as to whether the measure was Constitutional. It must be kept in mind that, as a former professor of Constitutional law, Obama would be more likely to recognize such Constitutional issues. Such devotion to the Constitution would be a welcome change. You may agree or disagree with Obama voting present on this specific vote but it is hardly a matter of substance to question Obama’s qualifications to be president, as Marsh presents this. This is simply a repetition of a current Clinton talking point which as, The American Prospect has noted, is really a recycled Republican talking point. Update: “We at Planned Parenthood view those as leadership votes.” More at Political Radar. Today is Festivus, the nondenominational holiday made famous on Seinfeld. The Festivus celebration includes The Airing of Grievances in which each participant at the Festivus Dinner tells each other all the instances where they disappointed him or her that year. In past years I have done an blog version in which I aired my grievances about George Bush. As Bush is now a lame duck, it is time to move on to those who are seeking to replace him. John McCain: My disagreements with you regarding your support for George Bush and the war, as well as your views on social issues, apply to most of the Republican candidates. In your case I will add one other grievance–your claim that the United States was founded as a Christian nation. Mitt Romney: After governing in a blue state you had the opportunity to help bring this country together by stopping the pandering of the Republican Party to the religious right. Instead you flip-flopped on issue after issue, the result being that you are trusted or respected by neither the left or the right. I hope you have learned your lesson as the Republicans are rejecting you for your religious views while liberals couldn’t care less what religion you are as long as you are willing to respect our heritage of separation of church and state. Rudy Giuliani: You could have also brought liberal social values to the Republican Party, but like Mitt you preferred to pander to the religious right. Your demagoguery on 9/11 and national security can only work for so long, and your lack of respect for civil liberties is even making some conservatives nervous. Mike Huckabee: You don’t know much about foreign policy, and your tax ideas are somewhat weird also. You share the same problems with all the Republicans on foreign policy and social issues, but the manner in which you bring religion into politics even makes some conservatives like Peggy Noonan feel uncomfortable. Fred Thompson: I’ll deal with you when you wake up from your nap. Ron Paul: Unlike the other Republican candidates you are right on Iraq and civil liberties, but anyone who takes opposing the federal government as the default position on all issues is bound to be right quite often. Your defense of the Constitution would make more sense if you were defending the Constitution as the framers actually intended it as opposed to ignoring those aspects which you personally disagree with, such as separation of church and state. Denial of this basic principle, as well as your views on states rights could lead to less as opposed to more freedom in much of the country. Your denial of basic science seen in your uninformed comments on evolution, along with your belief in ridiculous conspiracy theories raises serious concerns about whether you are out of touch with reality. Your ethics are also questioned when you fail to understand why a contribution from a white supremacist should be returned. Your past writings about blacks being prone to violence and lacking sensible opinions only exacerbates these concerns, which are not relieved by your claims that your newsletter was actually authored by others. Bill Richardson: I had much higher hopes for you earlier in the race but, barring a late miracle, it doesn’t look like your campaign is going anywhere. I had hoped you would bring a real debate to the race over economic policy but we had to settle for a simplistic push for a balanced budget amendment. Hillary Clinton: During the CNN/You Tube debate you tried to distance yourself from the word “liberal.” Too often you often seem to want to distance yourself from liberal positions as well to make yourself more acceptable to conservative voters. The only form of liberalism you consistently practice is big government liberalism of the worst type as problems are only addressed by increased government management of people’s lives. This was most clearly seen in HillaryCare I, but remnants remain in HillaryCare II making me question if you learned anything from the first fiasco. Your foreign policy views are not reassuring either as what counts was knowing whether it made sense to go to war before it occurred, not to jump on the anti-war bandwagon years later. John Edwards: I doubt that there has been a candidate in recent history who has shown such a chance of winning a major party nomination who is so poorly qualified. Bob Shrum got it right in calling you a “lightweight,” a “hyper-ambitious phoney” and “a Clinton who hadn’t read the books.” Your only real skill is an amazing ability, seen in your legal, business, and now political careers, to convince some that you have altruistic motives when your real goal is to increase your own wealth and power. There’s little difference between the junk science you used to win legal cases and the junk economics you now are using to try to win the Iowa caucus. Your commitment to liberal principles is even more suspect than Hillary Clinton’s between your relatively weak commitment to reversing the expanded power of the presidency to your health care plan which would make everything, including preventative care, mandatory. Barack Obama: I am still waiting for more of the promised specifics of your plans. You do show an excellent ability to at least show consideration of all views, but I’m not yet certain if this is a matter of framing or ideology which will impact the final policy. My suspicion is that in a couple of years I will be writing a number of blog posts disagreeing with some of your actions as president, but things will be far better than if any of your major opponents were to win. The media spends far too much time on the horse race as opposed to issues, and when it does look at issues they tend to concentrate on superficial articles about the issues chosen by the candidates to concentrate on. The Boston Globe has an excellent article where they researched the views of the candidates on an important issue which has received far too little attention–the views of limits on presidential power. Republicans support a much greater degree of power for the president with the exceptions of John McCain and Ron Paul. The Democrats show far more respect for the Constitution than the other Republicans but Clinton and Edwards do indicate less respect for limiting presidential powers than the other Democrats. The President must be free to defend the nation. While the Congress has an essential constitutional role in our national defense, the Supreme Court has also recognized that the president has certain core constitutional responsibilities to ensure that our nation can defend itself and our fundamental liberties in times of emergency. Controversies on this question are as old as our Constitution, and have been faced by many of our most respected presidents, and they will not disappear even after we have succeeded in the war that terrorists have declared on our citizens and homeland. Our aim must be to strike a balance between order and liberty that addresses the challenges we face within the bounds of the Constitution. 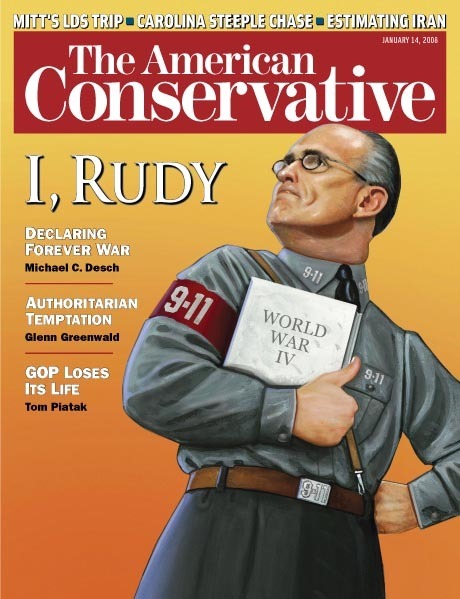 Giuliani’s failure to respond to specific questions on the limits of executive power will only contribute to the view of him as an authoritarian, which is even shared by many conservatives who are concerned about civil liberties, as is seen in the cover graphic above. I will not use signing statements to nullify or undermine congressional instructions as enacted into law. The problem with this administration is that it has attached signing statements to legislation in an effort to change the meaning of the legislation, to avoid enforcing certain provisions of the legislation that the President does not like, and to raise implausible or dubious constitutional objections to the legislation. The fact that President Bush has issued signing statements to challenge over 1100 laws – more than any president in history – is a clear abuse of this prerogative. No one doubts that it is appropriate to use signing statements to protect a president’s constitutional prerogatives; unfortunately, the Bush Administration has gone much further than that. In contrast to many such thoughtful statements by Obama, Edwards’ answers center around attacking George Bush as opposed to demonstrating real understanding of the issues or a real commitment to limiting executive power, as might be expected from one of the authors of the Patriot Act. Curiously Edwards did not even answer the question as to why it is important for presidential candidates to answer questions regarding the power of the presidency. This question would seem to play to Ron Paul’s strengths, but in reading his answers compared to the answers of Obama and others we see that Paul is not an especially deep thinker. When he takes the default position on all issues that the federal government and virtually all of its actions are wrong he is bound to frequently be right. I’ve noted in previous posts that, despite his reputation for being a defender of the Constitution, he defends a version of the Constitution which is far different from what the founding fathers envisioned and he misinterprets it in a manner to support his personal views. Paul’s misconceptions about the Constitution, as well as many of his bizarre economic views, are more understandable in his response to the question to identify the campaign’s advisers for legal issues. Paul responded, “I don’t have specific advisers, whether it’s economic or foreign policy, we don’t assign advisers, nor have we hired anybody.” That certainly is apparent in many of his views. Well, but the Constitution only has force on US soil, right, so the question is what happens when he is operating overseas? Do these other instruments bind him if the Senate has ratified them? If he’s overseas and the treaty is in effect and would protect human rights — see I keep thinking well we shouldn’t be over there. So if we’re there — and I can’t see myself being over there – well, okay, the answer would be that he would have to obey the treaty. After reading through this article and the answers submitted by the candidates I was definitely most impressed by Barack Obama, the second tier Democratic candidates who once again show they deserve more consideration than they are receiving, by John McCain for at least distinguishing himself from the other major Republican candidates, and especially by The Boston Globe for addressing this important issue. The business section of The New York Times features a comparison of two candidates and their two different views of wealth, looking at John Edwards and Mitt Romney. 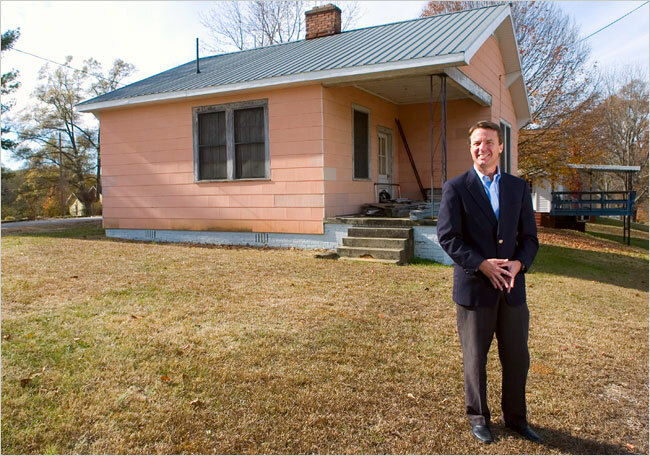 While the far left won’t get it (as they’ve failed to understand why Democrats have been out of power for so many years), the differences ultimately show why nominating John Edwards will lead to a return to power by the Republicans. Most Americans strive to earn their own fortune, regardless of whether this is realistic, as opposed to wanting to place the government in charge of every aspect of their lives. Far more Americans want to be part of the successful business world than want to tear it down and realize that a growing economy is the only way to really reduce poverty.Most voters will understand that while reforms might be necessary, John Edwards’ ideas are not the solution. Getting a cut from exploiting tragedies and convincing juries to award massive damage amounts is markedly different from building businesses and putting people to work. It’s not hard to see why the latter would feel his money was more deserved than the former. Or why the latter would see the virtues of a free market while the former would emphasize the contributions of others. Climate change creates the potential for areas outside of the tropics to face new infectious diseases. At least, should we be faced with new infections in the United States, conservatives who do not believe in global warming should have nothing to worry about–just as conservatives who do not believe in evolution have no need to receive a new influenza vaccine each year as the flu virus evolves to become resistant to the previous year’s vaccine.